TWO much awaited barn conversions in rural Shropshire have been released for sale by the award-winning developer, Seddon Homes. King’s Field Barns, at High Heath on the edge of the picturesque village of Hinstock, near Market Drayton, have been priced firmly in line with current market conditions. Constructed from the original solid walls, the three bedroom detached barns with garage, are selling for £325,000. Seddon Homes’ sales and marketing director, Denis Maddock, said: “King’s Field Barns are renovated to a high specification and provide excellent value for money in a fantastic rural location. “The barns offer plenty of original features, including vaulted ceilings in the bedrooms, and benefit from up-to-the-minute interiors perfectly in tune with today’s designer expectations. The development of King’s Field includes nine newly built prestigious detached houses, most of which overlook open fields on two sides. Hinstock is by-passed by the A41, making it easily accessible for Newport and Telford as well as Stafford, Stoke-on-Trent, Market Drayton and Wolverhampton. A Roman road, that connected the A5 Watling Street at Stetton to the A41 to Chester, remains today as a footpath through Hinstock. Mr Maddock added: “Hinstock is a long established village with a local pub at the heart of the community. 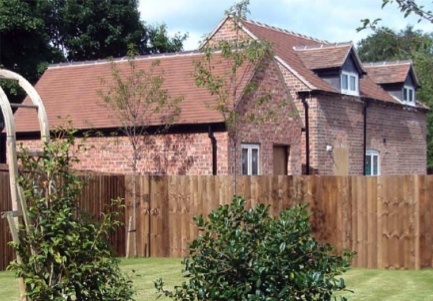 Seddon Homes, with offices in Stoke-on-Trent and the Midlands, has a reputation for developing homes in sought-after village locations and for sympathetically converting listed buildings dating back centuries. King’s Field is being developed on the site of a former mushroom farm. It takes its name from the Kingcup mushroom company that used to be located on the site. The view home is now available to view by appointment by contacting Rosemarie Jones of agents, John German, on 07956 600960.